Has it been a week already? Every day is a rush to get things done. Get up, feed the dogs, make sure the boy gets to the bus, get to work, after work errands, feed dogs, make dinner, check homework, clean up, fix something, shower and bed. The sink in the nephew's bathroom has been leaking. One day there was so much water that it tripped the GFI outlet. I couldn't figure out where that much water was coming from. Finally, after work on Thursday, I took the faucet off and re-connected it over a bucket so that I could watch for leaks. By chance, I turned the hot water faucet on in order to hook the faucet over the bucket. 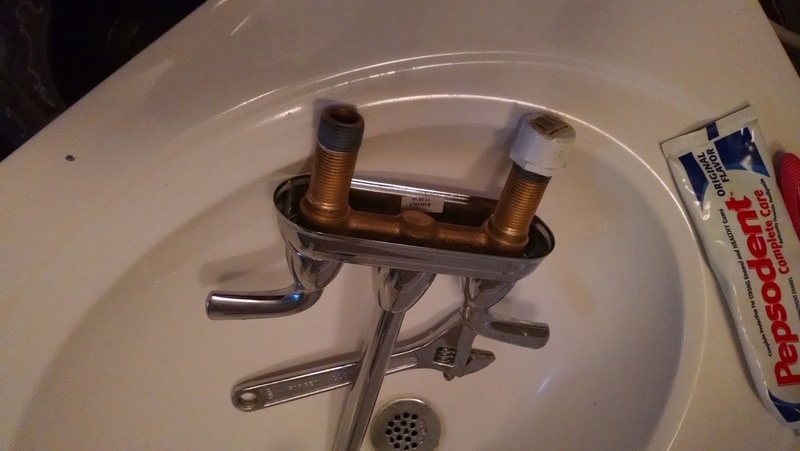 When I turned on the pump, water came pouring out of the hot water side of the faucet. It suddenly dawned on me what was happening. My nephew, either not remembering that the hot water is not hooked up or just by accident, has been turning on the hot water handle which allows the cold water to spray out under the sink. That is why I could not figure out where the leak was coming from. Every time I looked, it wasn't leaking but it was wet. I needed a hidden camera! The fix was easy, just screw a cap on to the hot water intake. At least, the fix was easy in theory. The plastic cap would not screw on straight. I tried and tried and finally I checked the threads and saw that the soft plastic threads had been cut by the metal pipe. Luckily, I had another cap and I was very careful to get it screwed on straight the first time. So far so good. There is another small leak that I need to fix and then I need to figure out what is causing the tiny leak in the drain. I explained this all to my nephew and told him he would need to diagnose plumbing problems when he has his own place. He said he wouldn't have to because he would buy a new house that didn't have any problems. Haha...good luck with that. Oh goodness me, you are really Daizy the plumber! How are things going? your mom, your nephew? I hope things are going okay. Lizzie, my kitchen area is still covered in plumbing supplies so you might be correct. I think it's about time to set up my kitchen. Microwave cooking is getting old. Anonymous, we are taking it one day at a time but so far so good. Mom will be leaving Florida on Sunday!